Image: Iranians celebrate the nuclear agreement. On April 2, the United States, Iran and other parties to the months-long negotiations announced an agreement on principles on Iran’s nuclear program. As planned, diplomats and technocrats from all sides are expected to work out the details by the end of June. With the negotiations having been conducted behind closed doors, there were few confirmed details prior to the announcement of the agreement. And no solid and undisputed specifics have emerged since. The sides consented to having each side publish their own version of a five-page document on the “parameters” of the agreement. Iran’s foreign minister, Mohammad Javad Zarif, has characterized that document as “spin,” saying that it had been drawn up under Israeli and congressional pressure. At the broadest level, the give and take of the negotiations had to do with the level to which Iran’s nuclear program would be limited and the speed with which the sanctions against Iran would be lifted. Should a final agreement be reached and implemented, Iran will have to significantly reduce or eliminate the enrichment of uranium to 20 percent purity and minimize the amount of stored 20 percent enriched uranium, which it uses in its medical isotopes. Iran will also have to accept limitations on the amount of uranium it enriches to any level and allow intrusive and frequent inspections of its nuclear facilities. In exchange, sanctions imposed on Iran by the United States, the European Union and the United Nations will be removed or suspended, likely in phases. Negotiations with Iran go back over a decade. But it has only been during President Obama’ second term that Washington has shown a real interest in reaching an agreement. Prior to that, what passed as negotiating was the U.S. issuing ultimatums, complemented with threats of military action. But the Obama administration and its wing of the U.S. ruling class have reached the conclusion that the Islamic Republic of Iran, as a regional power, cannot be eliminated. The Obama administration is domestically selling the agreement as a means of keeping Iran from getting a nuclear weapon capability and bringing it under some level of control. While Obama will, no doubt, jump at any chance to overthrow the Iranian state should the opportunity arise, his administration is accepting that regime change is not in the cards today. Congressional opposition to the agreement is strong, not just among the Republicans, who are now the majority in both houses of Congress, but also among some Democrats. Historically, imperialist powers rarely accept anything less than a complete capitulation from oppressed countries, which they consider to be their subjects. So it is understandable why a significant part of the ruling class is repulsed by the idea of the U.S. reaching any agreement with Iran, irrespective of the specifics. But the fact remains that the more hawkish wing of the U.S. foreign policy establishment does not really have an alternative. The U.S. lacks the resources to launch a full-scale invasion of Iran. And aerial bombings, no matter how intense, will not bring about regime change. War hawks like John Bolton and John McCain have called for Israel to bomb Iran. But if Israel were to bomb Iran, its main significance would be if it were to serve as a prelude to a U.S. bombing campaign. Israel has a formidable air force, thanks to U.S. patronage. However, even if Israel managed a wildly successful air campaign, making it to Iran through two other countries’ airspace, avoiding Iran’s air defenses and doing significant damage to Iran’s nuclear facilities, such an attack would only persuade Iran to move nuclear work to its facilities at Fordow, deep in a mountain, and possibly other underground facilities. What the Western powers and Israel really need is the overthrow of the state in Tehran. And, under the current circumstances, no scenario will yield that result. The Obama administration’s pursuit of imposing severe restrictions on Iran while putting regime change efforts on hold for now is a recognition of this fact. 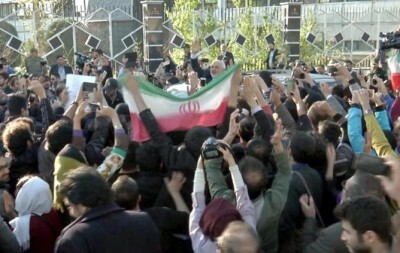 The announcement of the agreement was met with people celebrating in the streets of Tehran and elsewhere. However, significant parts of the people and the political establishment strongly resent the agreement. They view any restrictions on the Iranian nuclear program as inherently unfair, and justifiably so. After years of sanctions and threats, and the assassination of several nuclear scientists, they view reaching an agreement with the U.S. as a betrayal of Iran’s independence. How can Iran be subjected to limitations on its nuclear program on the pretext that it might one day want to develop nuclear weapons when the imposers of the restrictions are nuclear-armed states themselves? 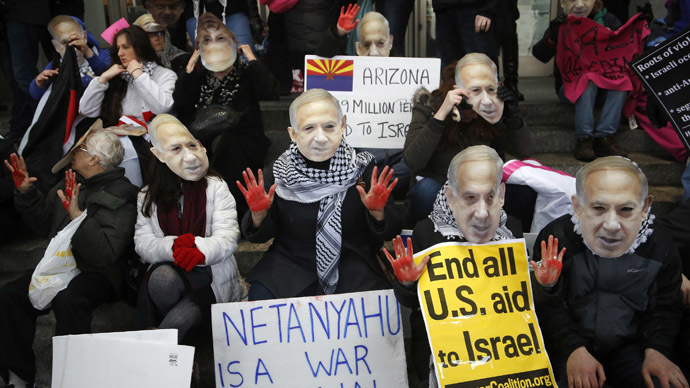 If threats made by various officials against the state of Israel are the basis for Iran posing a grave danger, why is it okay that Israel and the U.S. have for years been making threats against Iran, including the threat of nuclear attacks? Or is making threats of bombing and annihilation the sole prerogative of the U.S. and Israel? Why can “all options” be on the table for the U.S. and Israel, which do actually have nuclear warheads, when Iran is not allowed to state that it will retaliate if attacked? The economic sanctions against Iran were the determining factor in forcing it to make significant concessions. The sanctions did not completely paralyze Iran’s economy, as the U.S. and its imperialist junior partners had hoped. But they did result in a significant economic slowdown, the effects of which are most painfully felt by the working class. According to a report Secretary of Treasury for Terrorism and Financial Intelligence David Cohen presented to the U.S. Senate following the comprehensive U.S. and E.U. sanctions imposed in 2010, Iran’s economy is 15 to 20 percent smaller than it would have been without sanctions. Whether or not this figure is exaggerated, the fact remains that the extreme hardship imposed on Iran in conducting international commerce, including the sales of its oil and gas, has had a devastating effect on its economy. Despite being forced to make significant concessions, this is far from a capitulation. For years, various U.S. officials had stated emphatically that Iran needed to halt its nuclear work altogether. The only way for Iran to be welcomed by the “international community,” meaning the imperialist club, would be for it to shut down its nuclear program—no nuclear work would be tolerated. Whatever the details of the current agreement turn out to be, it is clear that Washington has had to significantly backtrack from that demand. Iran will maintain a nuclear program, including its nuclear power plant in Bushehr and its uranium enriching centrifuges, while having mastered nuclear technology in several fields. Imperialists do not typically back down from demands they place on oppressed countries. The case of the former Yugoslavia is a case in point. Before the 1999 bombing of Yugoslavia, in what were called negotiations, U.S. representatives presented the Rambouillet Accord on a “take it or leave it” basis to the president of Yugoslavia, Slovodan Milosevic. Rambouillet would require Yugoslavia to sign away its sovereignty and accept a NATO occupation of its soil. When Yugoslavia’s government understandably refused, the Clinton administration claimed that it had no choice but to bomb Yugoslavia. The Joint Comprehensive Plan of Action is no Rambouillet. President Rouhani and Foreign Minister Zarif could rightly point to the fact that Iran has forced the United States to accept its right to nuclear technology, however much the U.S. political establishment may resent this. Assuming that the agreement is finalized, it will be far from Washington’s maximum demand, a complete halt to Iran’s nuclear program. For an oppressed country, once under the complete dominance of the U.S.-installed Shah, this is a significant accomplishment. It is another nail in the coffin of the myth of imperialist invincibility. The threat to world peace is not the Iranian government. The U.S. government continues to be the most militaristic state in the world, whether under the softer leadership of Obama or the harder leadership of the neocons or the foreign policy hawks, which include many Democrats. Maintaining military bases around the world to uphold the capability to launch wars against any country requires an astronomical military budget. The U.S. working class, not the corporations, bear the brunt of this bloated military budget. But U.S. militarism, the requirement of imperialist dominance, serves the interests of the corporations, which maximize their profits by exploiting the working class here at home and getting their government to oppress other countries abroad. Fighting the imperialist establishment serves the interests of the U.S. working class.